Children have stuff – lots and lots of stuff, from their clothes to their toys and all the little junk in between. With a little thought, planning, and affordable solutions you will easily be able to get it all under control and keep it that way. Building the room with pieces that are built with organization in mind will also help simplify the process. 1. EXPEDIT shelving units outfitted with storage baskets come in many different sizes. The baskets are sold separately and are designed to fit perfectly inside each cubby. They act as decorative drawers to organize dolls, art supplies, or clothes. Tie a label on each basket or photo of what goes into each basket. This will help teach your child exactly where things are and where to put them when they are finished playing with them. 2. A bed that will grow with your child. Its classic styling will look as fresh and modern ten years from now as it does today. BIRKELAND bed frame with EMELINA ROS duvet. 3. When you are short on space double-duty furniture is the way to keep things under control. This BRIMNES dresser has 3 built-in drawers underneath that can take the place of a free standing dresser which will give your child more space to play in their room. 4. As kids grow so will the things they collect. Books, framed photos, sport trophies are only a few. BILLY bookcases look good in any room and come in white and 3 wood veneer finishes. Installing one or more of these will help you conquer the kids clutter quickly. When placing pieces in rooms where children will be- use wall brackets to anchor large pieces over 23 5/8" for safety. 5. Most kids use their beds as a surface to play on. It is their very own space, especially if they have to share a room. Covering a soft and comfy comforter with an affordable SMORGALL duvet in blue or green will surely please small personalities. 6. Buying furniture that will grow with your child not only simplifies things, but will save you money in the long run. HOPPEN 4 drawer chest with transparent drawers can be made fun by adding labels behind each drawer with what the contents are in each drawer- T-shirts, shorts, socks, etc. You can make the labels on white paper and print out with a fun font on your computer or even use a different color paper behind each drawer to make the piece more child friendly. When the child gets older the classic modern styling will seem hip and the labels will be nothing more than a pleasant memory of their childhood. 7. 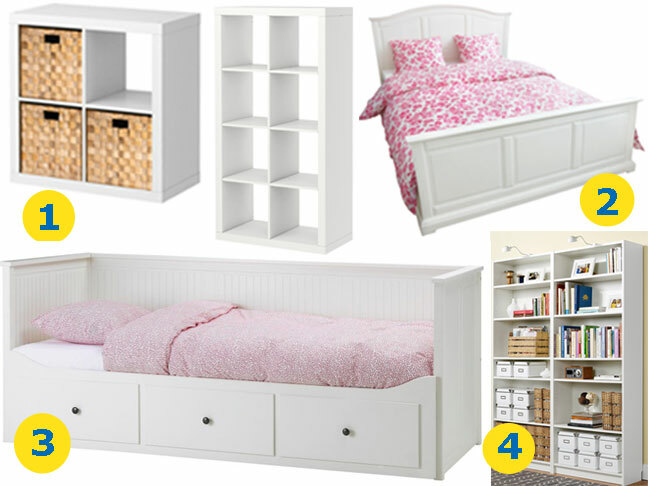 A bed that has storage underneath as well as behind will help organize clothes and books. The best part is that this storage won't take up any more floor space. Now that is smart! OPPDAL queen bed. 8. Kids like fun – This lamp fills the bill and will light their room in style. FILLSTA Table lamp. 9. 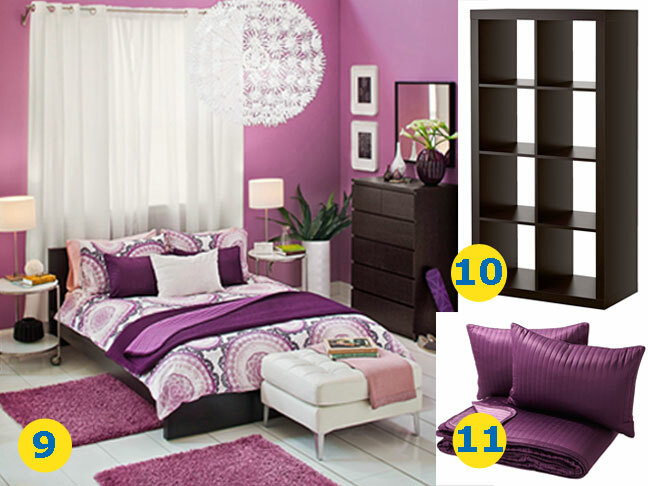 When your child becomes a teen they want to take the reins of how their room should be decorated and organized. The best way to keep both you and them happy is to set some parameters and give them some options in the way of colors and cost. This way they will feel like they are picking what they want – not mom. – They may be ready for a bigger bed as they will start having their friends sleep over more often. MALM queen size bed frame. – Duvets are an affordable way to change up the bedding with something modern and bold in pattern which most teens seem to gravitate to. LYCKOAX duvet cover set. – A large footstool or ottoman will provide end of the bed seating that can be moved around as needed. KARLSTAD footstool doubles as a table when a tray is placed on it. 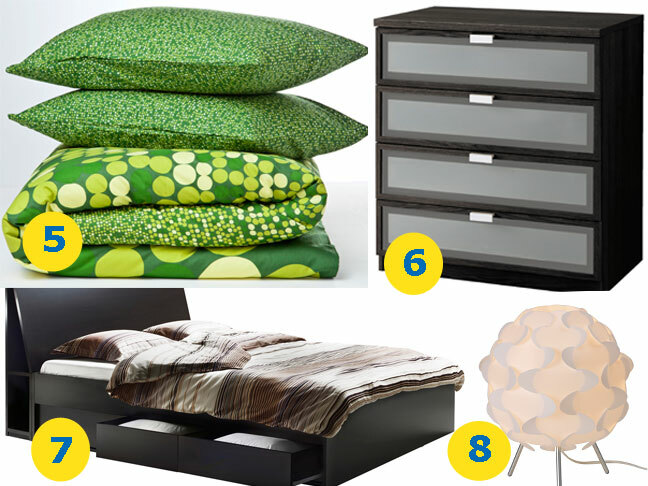 – A bedside table or two to hold an alarm clock, books, and other bedtime necessities. STRIND round table on wheels. -MASKROS pendant lamp not only provides overall lighting, but when switched on it throws a pattern on the walls – kind of like free wallpaper. 10. A place for all the stuff they have collected and love can easily be stored in an EXPEDIT bookcase. 11. Add layers of color and texture to the bed with KARIT bed coverings.